Check out the Green Matters section of our Web site, and you may recall that every order at The Shade Store means a tree will be planted by The Arbor Day Foundation. Last month we bought Green Patriot Posters, a new book promoting sustainability and the fight against climate change. Published by Metropolis Books at the end of 2010, it’s perfect timing as the year was tied as one of the warmest on record along with 1998 and 2005. 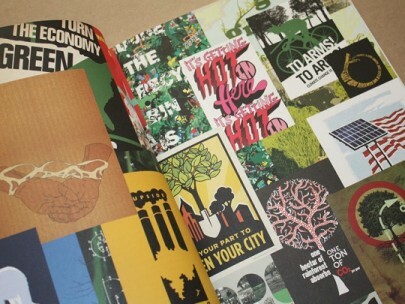 The book just made us want to rip out the pages and make a poster collage. Featuring strong and vibrant graphic design, it binds 50 posters selected from the project Website in rip-out and ready-to-hang format. “We want you to destroy this book…We hope you will tear out the pages and display them,” says the book editors, Edward Morris and Dmitri Siegel. You can purchase the book here. And shop Green with us here as well.